‘Winter Dreaming: an Australian Alps freeheel film’ (released in 2008) is both a telemark ski film and a celebration of the fleeting miracle of cold and snow on our old, flat continent. As was noted by Barry Park, in the Age newspaper, it is “part documentary and part eye-candy”. It features most of the very best tele skiers in Australia (plus a wonderful cameo from a Frenchman – Jean-Loic Mafayon – who is happily adrift in the ‘cool’, ‘slow’ mountain country of Australia). It also follows a range of ‘average’ folks and their experience of, and love for, the Australian Alps. And while it has lots of great shots of people in resort, it’s the backcountry images that really get me. If you’ve only ever skied inside the boundaries, then Winter Dreaming should provide a ‘to do’ list of places to get out into – from the big western slopes of the Snowies to the amazing east face of Feathertop. 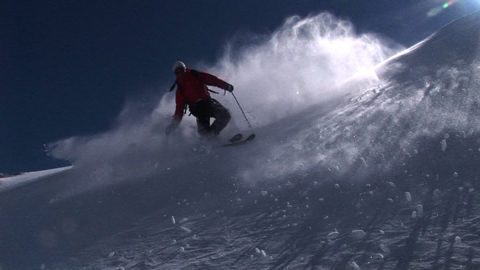 Sometimes it feels like we are awash in stunning ski and boarding films from the northern hemisphere. What makes Winter Dreaming stand-out for me is Stephen’s eye for detail and the often fleeting beauty in the landscape, rather than simply going for the ‘rush’ shots of people ripping down big slopes. The genesis of the film comes from his own experiences in the back country. “I was first blown away by the ferocity and magnitude of winter in the Australian Alps in 1990 when a mate and I tried to walk, sorry, wade hip-deep through fresh snow on Mt Bogong. The fact that we were nowhere near the tree line yet incredibly deep snow lay at a very low altitude was deeply impressive. Many subsequent trips, mostly by skis, to Mts Bogong, Baw Baw, Stirling, Kosciuszko and the Bogong High Plains cemented my belief that there was a side to the Australian Alps not well known. A quote from the film hopefully sums it up. ‘Take me to the deepest pockets of winter where I can melt away’. The Alps’ exquisite beauty, sometimes sublimely represented by ‘roo tracks in the snow, or in the exhilarating, storm-generated cornices falling off Mt Feathertop, are aspects of the mountains not commonly observed by the community. So too the many characters – all extraordinary, and sometimes epic – whose stories only reinforce the magnetism of this ancient landscape”. The film was a labour of love, with two years of filming and almost a year of production, squeezed in amongst other projects. The inaugural screening was in July 2008 at Falls Creek before a “packed and stoked crowd” in Milch Cafe’s cinema. Winter Dreaming focuses on the graceful linked turns of telemark – or freeheel – skiing. But the landscapes shown in this film include vertical terrain far bigger than you will find in our resorts and which are there for any boarder or alpine skier who’s keen enough to get themselves out in the back country. So, grab a copy of Winter Dreaming, watch the opening and closing scenes, and start on your check list of places to get out to in 2010. Winter Dreaming is just the start, with more projects in the pipeline. The next ones currently in post production include wanderings with wildlife in Antarctica and some wayward lessons learnt on a ski expedition of Russia’s active volcanoes in Kamchatka. To rent or buy a copy of the film, please check here. For further information on future projects, check here. For a profile on Stephen, check here.